Marina Isakova, MD, treats many types of painful conditions. Many of these conditions can’t be cured, but the pain and other symptoms can be managed, enabling you to lead a mostly normal life. Other conditions she treats are temporary, such as if you’ve had intensive surgery, and the recovery may take months. As a pain management specialist, Dr. Isakova helps you get through the recovery period. Your pain may have originated from an accident, sports injury, surgery, nerve damage, or metabolic issue. Your condition may produce stabbing acute or consistent dull pain. You may be experiencing chronic pain or pain from cancer, which changes from inflammatory to neuropathic. Everyone has a different sensitivity to pain, and Dr. Isakova adjusts her treatments accordingly. Dr. Isakova received her MD degree from the Andizhan State Medical School, where she also completed her residency program in internal medicine. Later, she completed one residency program in General Surgery at the NYU Medical Center and another in Physical Medicine and Rehabilitation at the Kingsbrook Jewish Medical Center. She has excellent research credentials as well, with several research publications in peer-reviewed journals. 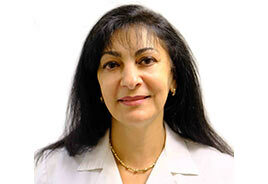 Since 1986, Dr. Isakova has practiced medicine. She currently works at the Century Medical and Dental Center and at Kings Medical PC. She’s also affiliated with the New York Presbyterian Methodist Hospital. Fluent in English and Russian, she received the Compassionate Doctor Recognition Award in 2014. Schedule a pain management consultation with Dr. Isakova.